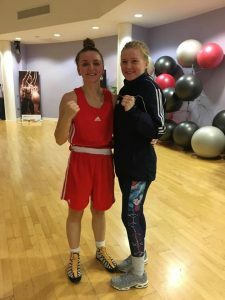 After waiting all day and watching both her team mates become National Champions it was Lily Devlins time to step into the ring for the last bout of the day. 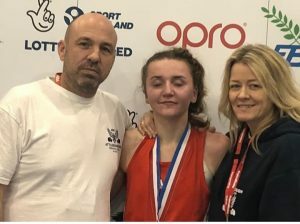 This was Lilys chance to win the National Development Title she had worked so hard for in the gym leading up to this day, the pressure was on as she faced a tough boxer from the Western Counties. 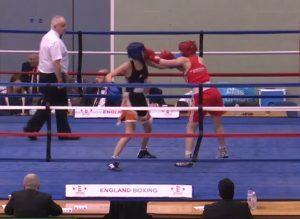 As the bell sounded both came out to try and stamp an early authority on the bout but it was Lily whos skill came to the fore moving well avoiding the big punches and attacking her opponents body as well as head. 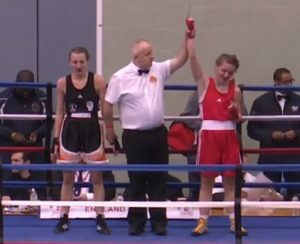 Lily kept composed and whilst avoiding the big rear hand of her opponent was all the while picking the Weston Warriors girl off with good single scoring punches to win round 1. The popular TeamABC boxer came out for the second round and once again started the brightest and was scoring well with good clean punches, halfway through the round Lily really took control when she unleashed some good combination of punches but her opponent showed her strength and quality by not relenting and kept coming back with punches of her own but it was our boxer who had won the round. The Robert Kemp Cars Ltd sponsored boxer just needed one good last round to win the title she so richly deserved and she came out and remained focused continuing to just box and not get involved in any brawl and she completely controlled the round putting in a very good display of boxing. Lily had done it!! 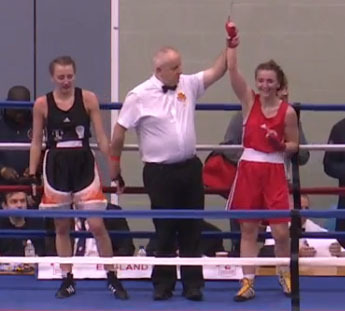 and was crowned the National Development Champion – Senior Female Class B 54kg by way of a unanimous decision to the delight of the team. Which ended a great day for TeamABC who came away with Three National Champions. Well Done Lily on such a great result and achievement.